This post was first published by The Croydonist on 11/01/2019. Festival season seems to be ever expanding each year in Croydon, from performance art and theatre to Gay Pride and Mela celebrations. We’ve seen recent events and activity thrive, such as Croydon Rocks, Croydon FM, Hoodoos at Front Room, and The Oval Tavern. All drawing in music fans, hungry for entertainment. It’s pretty inspiring stuff. So much so, that after consuming probably too much wine, we decided to roll up our sleeves and get involved. So here we are, introducing you to our newest venture, a one day music festival. Welcome to Cro Cro Land. 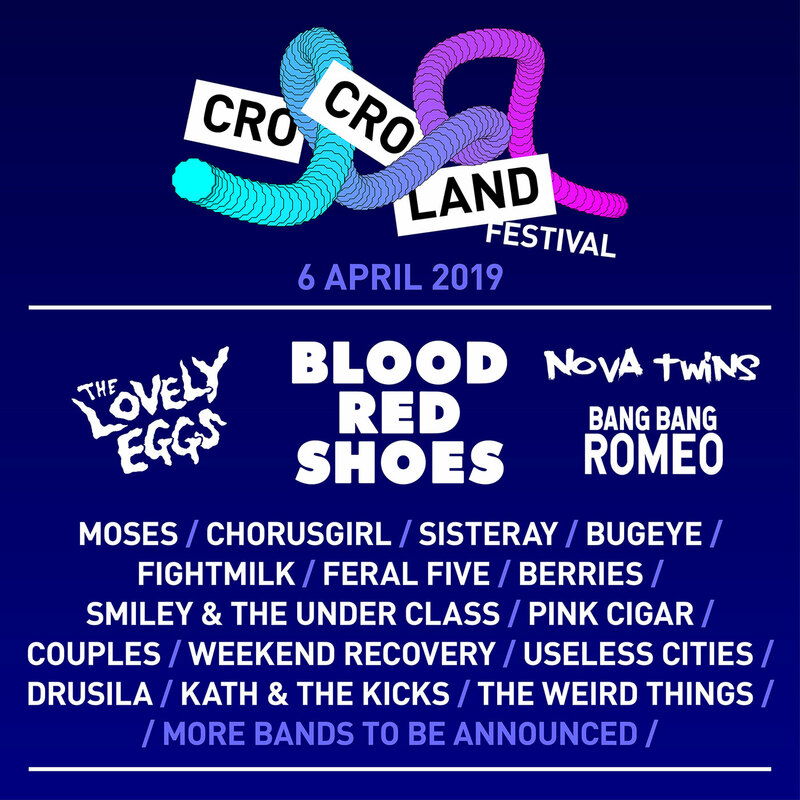 Cro Cro Land is a 1 day music festival taking place on Saturday 6 April. Expect three indoor stages, 30+ bands and DJs, plus a mini food market too (food stalls, please do get in touch). It’s going to be held at one super cool venue complex (The Lansdowne Hotel and Urban Xchange). Excited already? Grab a ticket here and then keep reading for a sneak peak at some of the bands. The festival will bring together a handpicked line-up of the best in indie and alternative music by both established and up-and-coming bands. With gender equality at the heart of every part of the event, festival-goers can not only expect a balanced bill, but also a crew where women are fairly represented. We are working with local charity, Lives Not Knives as well, and support them with a £1 donation for every ticket sold. Now you know what’s what, let’s bring on some of the bands with a nifty 10 preview. Blood Red Shoes are an alternative rock duo from Brighton, consisting of Laura-Mary Carter and Steven Ansell. They’ve played around the globe, sold out shows left right and centre, and now we are super excited that they’re coming to Croydon to play. Their brand new album, Get Tragic, comes out on the 25 Jan. The Lovely Eggs are an underground surreal-psych punk rock duo from northern England. They have a fierce ethos that music should have no rules. Expect fun, snappy, garage punky sounds with a touch of kitsch. Amy Love and Georgia South from South East London have been taking the underground scene by storm with their hard rocking tunes. Their punishing sound and energetic live performances have seen them captivate audiences across the UK and the rest of the world with shows. Fronted by vocal powerhouse Anastasia Walker and featuring Ross Cameron (guitars) and Richard Gartland (drums), Bang Bang Romeo are a propelling force for female-fronted bands in a male dominated industry, and a strong and open voice for the LGBT community. Anastasia’s “once in 20 years voice” is unrivalled and the group’s larger-than-life performances are sending audiences wild up and down the country, leaving them with jaws dropped and often reduced to tears. Feral Five make electro-punk dance music with bite, fusing snarling guitars, stabbing synths, and ferocious beats. Their future-facing tunes feature on BBC 6 Music, Radio X, and in film – their latest release ‘Pet Show’ is set in a world of AI and robo-companion bars and has been championed by Gideon Coe. They’ve played Music Tech Fest with a 3D printer, performed at the National Portrait Gallery for Martyn Ware, and up in the trees in a gothic graveyard at Danny Boyle’s Shuffle Festival. Chorusgirl make noisepop, blending the sounds of Lush, the Cure, The Breeders, Pulp, the Bangles, surf, girl groups, melodies, dirt, jangle and noise into a swirling and shimmering mix that spins your head until you’re dizzy. In 2018, they were signed by growing British indie label Reckless Yes, joining the likes of Liines, Lorna, Fightmilk, and more. Their second album ‘Shimmer and Spin’ was released on 16 November to rave reviews. Blending big breakdowns with instrumental hooks and catchy choruses BERRIES have caught the attention of tastemakers nationwide including Fender, BBC 6 Music and Radio X, a feat that has seen them play notable festival stages including Liverpool Sound City. We caught them recently at Birthdays in Dalston, and the band did not disappoint. Soaring guitar hooks, with lush vocals to a packed room of hungry fans. Mark my blogtastic words, this is a band that will go far. Blending influences of Electronica, indie rock, and 80s synth-wave, Drusila are a duo who demonstrate an ability to create music to dance to as well as something reminiscent of the ‘Drive’ Soundtrack. Impressively, they only formed at the start of 2018. These guys are certainly ones to watch, so make sure you catch them on the Concrete Playground Stage at Cro Cro Land. Croydon band, The Weird Things absolutely smashed it at Croydon Rocks last year and have built themselves a reputation of a band that delivers. The members’ individual music CVs alone impress, and together they make a pretty awesome unit that continues to win them fans. Have a listen and you’ll totally get what we mean. A million streams for their single in the blink of an eye and a formidable live reputation growing. The band have played some of the biggest venues in Britain opening for the likes of Feeder, Ash, The Enemy, Frank Turner and Jimmy Eat World. Their own headline shows do not disappoint so be sure to catch them at Cro Cro Land. So there you have it. A sneak peak at just a few of the bands that we have in store for you at Cro Cro Land this year. There’s just too many for one article! Plus we have a super exciting surprise guest that will be revealed soon…. Early bird tickets have sold out, but general admission tickets are on sale now from See Tickets here. Keep up-to-date with festival announcements on the Cro Cro Land website, twitter, instagram or facebook. Also find out more on the festival website about our awesome partners who are championing the grassroots music scene, including The Zine UK, Get In Her Ears, Joyzine and Benumu.